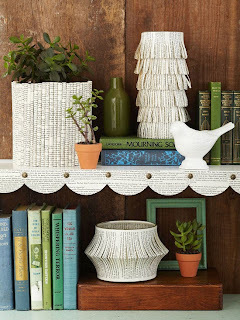 Simple Scallops ~ For beautiful shelf edging, punch 4"-diameter circles from book pages. Fold each one in half, and overlap them along a shelf edge, using upholstery tacks to secure. 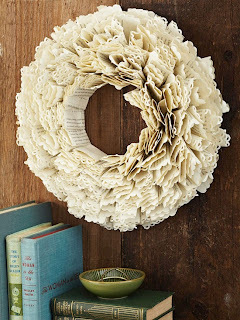 By-the-Book Wreath ~ Give book pages a dramatic redo with frilly, border-punched edges. Folded and stacked strips round it out. Roll It Up Vase ~ Cut old book pages into rectangles; then roll each one tightly and secure it with paper glue. Attach the rolls to the sides of a glass cylinder with double-stick tape. 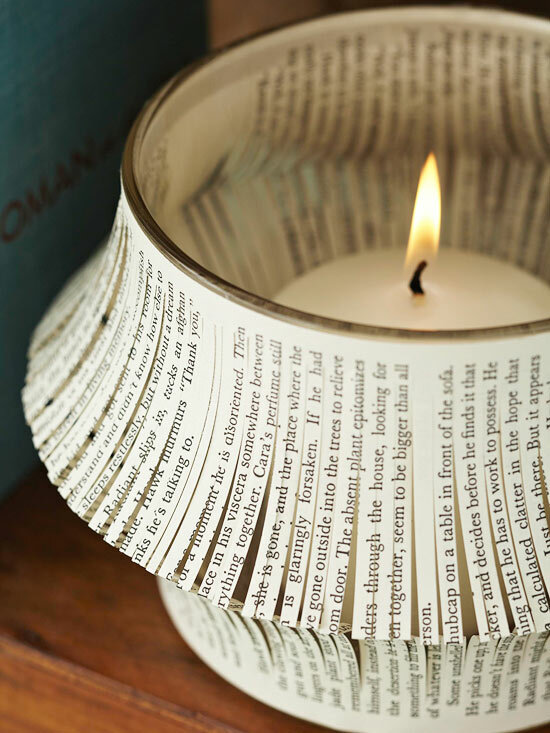 TIP: Use kids books for their rooms, cookbooks for the kitchen, etc. On the Fringe Vase ~ This vase and the tall vase on slide 1 both start with a book-page strip cut long enough to fit around the circumference of the vase. Fold the strip in half lengthwise, and cut into the folded edge with fringe scissors. 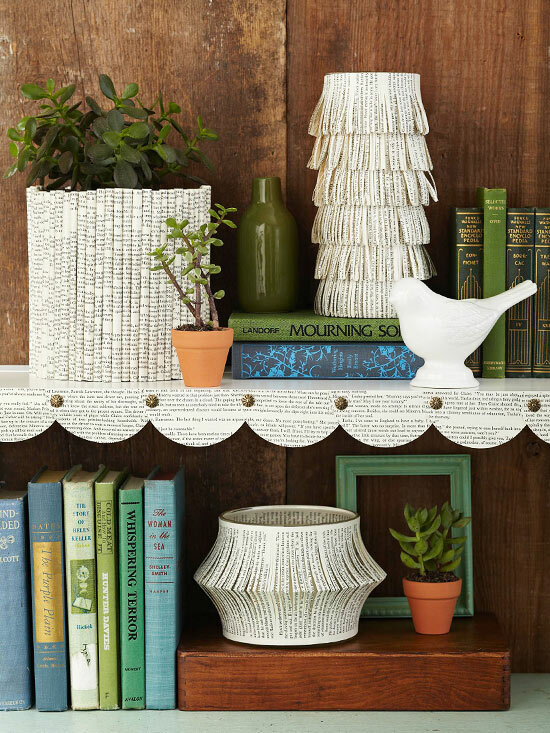 For the tall vase, attach several fringed strips to the vase along the uncut edges with double-stick tape, overlapping the pieces. For the short vase, unfold just one strip, attaching the uncut edges to the vase and letting the folded edge bow out. 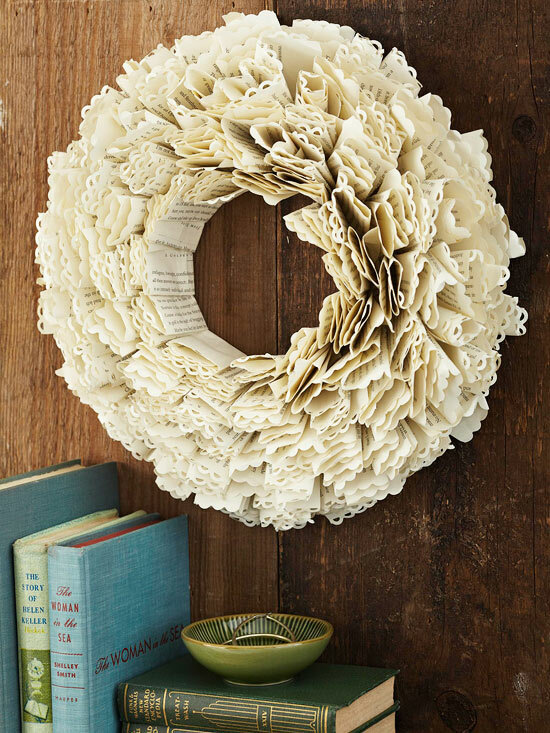 TIP: Use holiday books for seasonal decor. 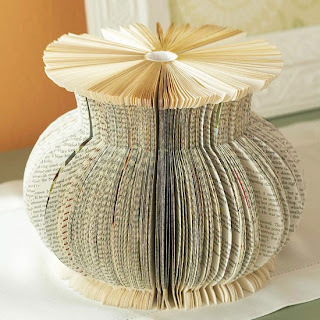 Book Binding Vase ~ Here's a novel idea: turn an old book into a decorative vase. For the template, draw the shape of half a vase onto cardstock and cut it out. Open a book to the first page and trace the template, with the flat side against the binding. Use a crafts knife to cut along the template and slice through several pages; repeat until you've cut through all pages. Remove the book cover and open the pages until the first page meets the last. glue the first and last pages together with spray adhesive. 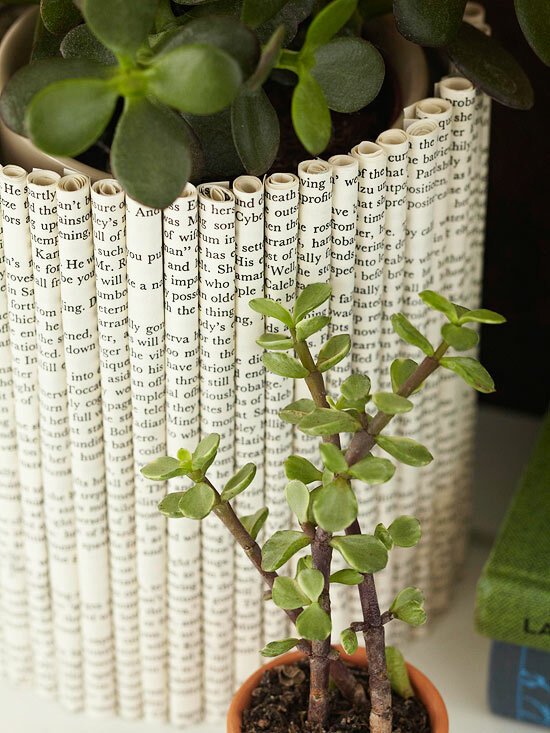 For a fuller look, use two books by gluing the spines together.